In Ayurveda, fresh homemade yogurt is said to possess immensely different qualities than its store bought counterpart; the homemade version being healthy, medicinal, cooling and sweet while the store bought is considered heavy, viscous, stale, heating and sour. 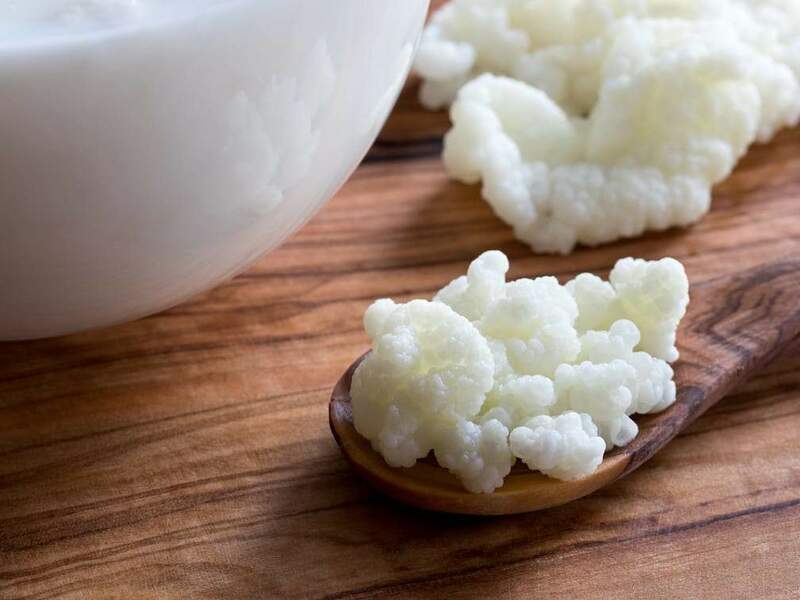 Being of the same nature, homemade kefir shares these same life-promoting properties and is considered even healthier overall due to the vast number of probiotic strains that inhabit one culture (10-20+ on average!). Yogurt on the other hand often only contains 1-2 strains. If this isn’t enough to get you on board, making homemade Kefir is much more simple and fool-proof and can be accomplished with only minutes of prep-time. Since about 99% of all health issues stem from a weak or imbalanced digestive fire (Agni), taking in a variety of probiotics from a real food source is essential to support healthy gut flora and therefore a healthy You! 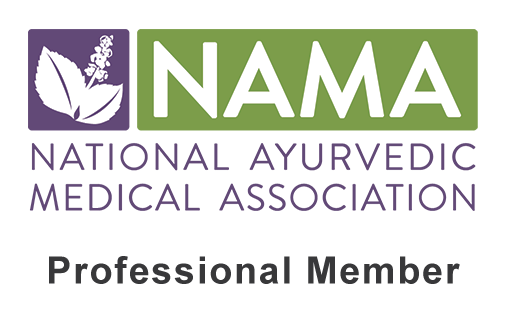 Unfortunately with our over-stress, over-medicated society, imbalances in the gut flora known as dysbiosis is beyond prevalent these days. In fact, some of these unwanted bacteria strains that take over in the GI tract have been shown to have a very direct correlation with a wide range of diseases such as Alzheimer’s, type 2 diabetes, chronic fatigue syndrome, allergies, asthma, obesity, metabolic syndrome, celiac disease, IBS, IBD, SIBO, leaky gut, Candida, certain cancers, Autism and mental disorders of all kinds. 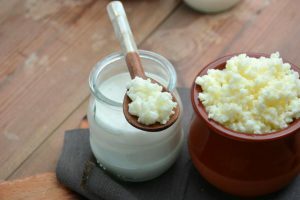 Although kefir can be made using a non-dairy alternative, this is usually unnecessary since the lactose is mostly broken down by the time the fermentation is complete. Since lactose is often the culprit with dairy intolerance in many individuals, this makes the kefir much easier to digest compared to plain milk. Using a high quality, organic milk such as Organic Valley Grassmilk (ideally the whole milk version) will also be essential in ensuring the healthiest, most digestible and best tasting kefir. If you still prefer a milk alternative however, a homemade nut milk, seed milk or coconut milk can be used with similarly tasty, health-promoting results (see the additional tips below for more info). Making kefir is extremely simple, requiring very little effort and minimal prep time. The fermentation process generally takes about 1-3 days depending on your desired taste and fermentation results and is done using a living kefir grain culture that is made up of lactic acid bacteria and healthy yeast strains. The final result is a drinkable yogurt-like beverage that is a bit tart, a bit sweet, slightly carbonated, creamy and delicious. If plain kefir does not float your taste bud boat, do not fret! There are many flavorful additions to add such as honey, maple syrup, cinnamon, mesquite powder, cardamom, cacao powder, shredded coconut and vanilla extract to name a few. Important note: Although blending the plain kefir with fruit would be tasty, it is strongly not recommended since the combination of fruit and dairy should never be taken in at the same time. This is considered a very harmful food combination and will cause digestive imbalances rather than promote digestive health. Read more on the Improper Food Combinations here. 1. Before beginning make sure the glass jar and stirring spoon are clean and sterile. Once the materials are ready, pour the kefir grains into the glass jar using 2 Tbsp of grains for every 4 cups of milk. 2. Then add in the milk until the jar is just about full, leaving about 2-3 inches of space from the top of the jar. This space is needed as the fermentation process often makes the liquid expand due to the carbonation and the proliferation of the grains (yes, a healthy culture will grow and multiply with each batch). 3. Cover the jar with the thin dish towel, using a rubber band to tightly secure it (make sure there are no holes or openings for fruit flies to sneak in). 4. Leave the jar out in room temperature* for 1-3 days, depending on your taste preferences. The longer the fermentation time, the more sour (and less sweet) the drink will become. I typically allow 2 days fermentation time for my most favorite results. *The ideal temperature will be between 70 and 75 degrees. If it is warmer than 75 degrees, less fermentation time will be needed. If it is cooler, a bit more fermentation time will likely be needed. I often will place the jar on the stove (away for the burners) during the winter to allow a bit more warmth. 5. Once the desired fermentation point has been reached, pour the finished kefir through a fine mesh strainer or clean cheese cloth and into another wide-mouthed jar… Congratulations, you have made your first batch of homemade kefir! How long will your finished kefir keep in the refrigerator? The finished kefir can be kept in an airtight jar in the refrigerator for an average of 2-3 weeks without spoiling, although a very slow fermentation process will continue and make it more sour and carbonated overtime. 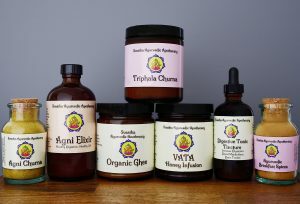 It is most recommended to eat this within 7 days to keep the qualities fresh, sweet and full of life-promoting Prana! How do you store the remaining kefir grains? The strained kefir grains can be placed in an air tight small glass jar, completely covered in fresh milk and kept in the refrigerator for up to 3 weeks. I prefer to place them directly into another larger glass jar to begin a new batch of kefir straightaway. This is the best way to ensure healthy grains that will create a steady supply of nutrient dense kefir! Looking to jazz up your plain kefir? Some great additions include maple syrup (best for Pitta and Vata), honey (best for Kapha and Vata), fresh ground flax seed, shredded coconut, mesquite powder, vanilla extract, cacao powder and/or chia seeds. Spices can also help add a more pleasurable flavor (and more health benefits!) 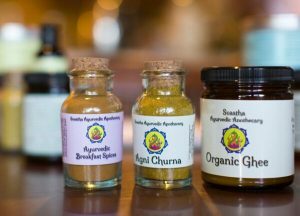 such as cinnamon, cardamom, ginger, turmeric or roasted cumin seed. Kapha types should drink the kefir mixed with water (1 part water to 1 part kefir) and add in a tsp of honey, a pinch of black pepper and a pinch of ginger to reduce the Kapha-promoting qualities of the dairy. If this is still too much, it is recommended to use goat milk or a non-dairy alternative such as homemade almond milk or hemp milk (click here for our recipe). Pitta types should avoid fermenting the kefir for more than 2 days, as this will increase the heating qualities and Pitta-provoking sour taste of the beverage. Once should take 4 ounces of the kefir, 1-2 times daily for promoting healthy gut flora and treating digestive issues. When using a non-dairy alternative, one should soak the grains in dairy milk between batches to ensure healthy, active kefir grains. The first batch may need to be done using dairy milk as well since they can be sometimes a bit weak when they are initially received. Otherwise, making them using a (preferably homemade) nut, coconut or seed milk is a great option! Kefir can be taken directly after a meal with a pinch of roasted cumin seed to promote healthy digestion (similar to a lassi beverage). Never take kefir with fruit as this is considered an Improper Food Combination and will lead to further digestive issues and toxic accumulation in the GI tract. Kefir is safe for children and can be taken in small amounts from 1 year on. Kefir is safe and highly recommended to take during pregnancy and postpartum.